Rumson, New Jersey. I’m extraordinarily lucky to have 3 karting tracks near my home. Oakland Valley Race Park (OVRP) is 2 hours North. New Jersey Motorsports Park (NJMP) is 2 hours South and Englishtown Raceway Park is 25 minutes West. Since Spring 2012, in my Kid Kart. At 3 – 5 years old, I would look at car magazines, as well as watch YouTube videos of exotic cars online. At 5, I got to see an Indy Race up close (The Baltimore Grand Prix), Labor Day Weekend 2011 and once I heard those engines roar by at 200+ MPH, I knew I wanted to do it myself. My Dad researched online and found a 2-day, Pee-Wee, Intro to Kid Karting Class at NJMP. It was the most fun I’d ever had. Next Spring 2012, my Mom & Dad bought me an early Birthday gift, a used, red, Birel, Kid Kart and I began racing at Englishtown Raceway Park. That first season, I met older WKA racers, Tyler & Conner Ferris, Ryan Raffa and Nick Landi. WHAT IS YOUR FAVOURITE PART OF RACING? The difficulty and precision involved is what sets racing apart from other sports. The feeling of accomplishment after you’ve improved on lap times, or learned a new technique or made the podium, is the best feeling. It is an amazing feeling to be satisfied, exhausted, pumped up and euphoric at the same time. I have finished most of my WKA races in the Top 10, but have never made the podium as yet. The closest I came was 5th place at Pitt last May after the rain storm and I Qualified P2 in Jacksonville last February. My immediate goal is visualizing myself running my best race and being on podium soon. I also want to analyze more of my racing video footage and Mychron data at home by myself. Mostly getting focused and getting the racing line down as best as possible. The start, passing or battling, can only take place on track, so I try to remember how to do it better from previous races. Remembering my coach’s instructions is the most important ritual. No one on the planet can drive like Ayrton Senna did. Obviously, in F1 today, I love to watch Lewis Hamilton, because he drives great, plus I’m told I resemble him. Daniel Ricciardo is a great driver, and a position bandit. He can steal any race at any moment with his late braking superpowers. I’m a big fan of Sebastien Buemi and Lucas DiGrassi in Formula-E. Of course, I admire fellow Kart racers like: Anthony Gangi Jr., Ben Cooper, Dylan Tavella, Tazio Torregiani, Matt Solarczyk, John Bonanno and Brandon Jarsocrak. When I was 6, on vacation, I got a coaching day on the island of Jamaica at Palisadoes Raceway. That track is literally a mini peninsula, next to the runway at Kingston airport and has coconut trees lining the chicanes. It is so cool to come down the straightaway, while a 737 jet is landing a ¼ mile away, parallel alongside of you! GoPro Motorplex is probably my second favorite track because of the layout and the history with Parma. The NJMP 1.03 mile Tempest layout is the first track I’d ever driven on and it’s almost like a rally race through the countryside. The straightaway at Jacksonville Winter Cup was so fast, I hit almost 70 mph in Micro Swift. Each track has its own personality, including New Castle where you spend most of your time bump-drafting or F1 Outdoors Boston’s banked turn, or OVRP’s new layout, which is extremely technical! WHAT DO YOU LIKE ABOUT WKA RACES? I like the family atmosphere, the race officials and the overall camaraderie. I appreciate that they have a quick Sunday worship service before qualifying. Even though it’s intensely competitive, if a driver’s engine is unable to start on the grid, you always see at least 4-5 Dads crowded around that kart, helping to get that driver going! At WKA races, there’s a mix of very fast kids, kids who compete regularly in the series and a few new kids on track. In 2016, my coach-tuner, Michael “Chi Chi” Ramirez recommended I add an IAME Micro Swift to my second chassis and start the WKA season at GoPro Motorplex. I had never been to a National race, other than a local club or regional Rotax race before. My whole family came to my first WKA race that April and I finished 7th on Day 2 and made a lot of new friends (Sofia, Hunter, Mateo, Alex, Hoyt, and Armand). I also like that I compete against other kids on track, but after our race is over, we all ride scooters, play manhunt or play video games together. WHICH WKA RACE SERIES DO YOU RACE? Manufacturer’s Cup, starting our 3rd season now. I’ve been to all of the WKA tracks except Wisconsin and Chicago. I also raced in two of the WKA Winter Cup races in 2017. That season, Daytona was a HUGE field with almost 34 karts and we had so much fun racing in Jacksonville! I have a syndicated web site, called KidzSpeed.com. I started it for fun when I was in Kid Karts, just interviewing other kart racers at the track. From there, I got to interview Indy drivers, a few celebrities, and it took off from there. I still do interviews. My two most recent were The Jetman (jet wing flyers from Dubai – very cool) and last month I toured NASCAR team, Joe Gibbs Racing facility in N.C. The major articles and interviews are on my website, KidzSpeed.com. More regular content and WKA race photos are on my KidzSpeed Facebook and YouTube pages. In addition, I’m a Boy Scout, I play alto saxophone, I run the 100 meter and I LOVE to ski. Of course, I’d love to make it to being a Formula 1 or Formula–e driver. I am a huge open wheel fan. In addition to racing, Because I love my STEM classes at school most, I see myself going into some type of engineering technology, tied to nanotechnology, electro-hydrogen powered engines, aerodynamics, carbon fiber design, or maybe even Formula E’s Roborace. Every year, I go to RaceCraft One in Indianapolis for simulator training and I really am impressed by the software, telemetry and capabilities the simulator can duplicate. I am most fascinated by the blending of science plus human element around predictive analytics and Artificial Intelligence for race outcomes. ARE THERE ANY OTHER INTERESTING THINGS YOU WOULD LIKE TO SHARE WITH US? Racing is a nice release for me because school takes up a LOT of my time, as I am labeled “Profoundly Gifted & Talented” (IQ=147) which means I take really some hard classes for my age. I’m in 6th Grade and next year I will take Algebra 2/Pre-Calculus, Physics and STEM Robotics. I was scheduled to be on LifeTime TV’s, “Child Genius, Season 2” – the camera crew was scheduled to film me racing at a track, but due to their rigorous competition schedule of back and forth between L.A..and home, my family had to defer until the next season. I’m supposed to graduate high school and start college by age ~16. Truthfully, I love learning cool, new things in school, but I most like being a normal kid, playing video games and racing my go karts. The most important thing about karting is to always “have fun” – first and foremost! My tag line on KidzSpeed.com is “Safety first and see you at the finish line”. PINE SPRINGS, MN - This week's WKA #RaceLife Spotlight racer just started at Purdue University and has been racing karts for 12 years! Alexander Kardashian is 18 years old and races in the Bridgestone Manufacturer's Cup Series. He was also a National Champion in 2015. His favorite driver is Max Verstappen and loves coming to WKA races because of all the competitive racers who attend. Alexander plans to graduate from Purdue with an Engineering degree and wants to use his degree by becoming an engineer in the motorsports industry, preferably on a racing team. Read more about Alexander below. "I used to live in Pine Springs, Minnesota (a suburb of Twin cities), but I have just moved to Purdue University. Boiler up!" "I am currently in my twelfth year of racing." "My dad has always enjoyed racing and since he couldn’t do it when he was young, he let me try it at a track near our home. I loved it and still do." "My favorite moment in racing is when I am coming up to a passing zone on someone’s bumper and I get to dive inside for the lead." "I am going to be an Engineering Major at Purdue University.."
"I get in to the kart from driver’s left and then retighten my helmet." "PittRace in Wampum, Pennsylvania because it’s a fast track, with super-fast chicanes, elevation changes, and lots of technical corners." "I love the stiff competition that shows up to race." "I love to work-out and play cards. I also help my dad run our business, AMK Race Products." "I want to be an engineer in the automotive industry…preferably with a racing team." "I have a lot of seat time playing F1 2016 and have a top 50 time at 5 different tracks in the time trials of that game." BALTIMORE, MD - This week's WKA #RaceLife Spotlight racer has his sights set on racing in Formula 1 one day. Max Khordorkovsky is 13 years old and has been racing karts for the past 2 years. His favorite F1 drivers are Max Verstappen and the late Arsyton Senna. Max enjoys racing, playing lacrosse, working out and working on his kart. He has a contagious smile and a great attitude as evidenced by his favorite part of racing; in seeing himself progress every race weekend. Read more about Max below. "I live in Baltimore, Maryland." "I’ve been racing for two years." "My dad took me to a karting track one day and I told him this is what I want to do ." "My favorite part of racing is seeing myself progress." "My goals for the future are to get picked up by a team and race in Europe then I would like to move to F4 and make my way to F1." "My pre-race ritual is to sit it my kart with visor down, close my eyes and do a quick prayer." "Late racer Ayrton Senna and alive Max Verstappen." "Karting- Summit Point main track F1- Silverstone." "I work on my kart, workout, focus on school, and play lacrosse." "I want to become a F1 driver because I can be like my hero Aryton Senna and I think I have a lot of potential." PEEBLES, OH - Our next #RaceLife Spotlight racer will most likely be packing up this afternoon to make it to New Castle Motorsports Park this weekend for the Manufacturer's Cup race. Colin Neal is 15 years old and has been racing karts for the past 4 years. His favorite F1 driver is Lewis Hamilton and Colin hopes to one day follow in his footsteps in becoming a professional racer. Even more impressive than Colin's aspirations is his attitude! Seeing that Colin's favorite race track is NCMP, it would be fair to say that we can anticipate a good result from him this weekend. Read more about Colin Neal below. "I live in Peebles, Ohio." "I have been racing for 4 years." "I had always seen karting in ads and videos and really wanted to get into it. My dad eventually took me to an indoor karting track. He started showing me the lines and etc. I picked up on it pretty quickly. At that point, my dad thought that karting was something we should get into. We started at the local level and soon moved on to the regional and national levels of karting." "My favorite part of racing is when the kart setup, driving and everything clicks. Winning isn’t so bad either." "My goal in racing is to eventually get into professional car racing." "I usually say a quick prayer before I take track." "My favorite racer would have to be F1 driver Lewis Hamilton." "My favorite track would have to be Newcastle Motorsports Park." "My favorite part about WKA racing is that most of the people involved in the series are nice genuine people." "Besides racing I play basketball." "I would like to move up the motorsports ladder and hopefully become a professional driver of some sort. As of now I would like to go into motorsports engineering as a second option." FT. MILL, SC - Our last #RaceLife Spotlight racer hailed from Indiana and this week we head all the way down to South Carolina to feature Will Robusto. Will's twin sister, Isabella, was featured back in April, but Will has dreams of one day driving on a NASCAR cup team and enjoys the competition at WKA races. Will has a great attitude and now we know, in part because of this interview, that he gets a lot of energy from his pre-race ritual of eating tons of candy! He is also super athletic, playing soccer, football, basketball and racing legend cars on top of his karting. Read more about Will Robusto, below. "I live in Ft. Mill, South Carolina." "I have been racing for 6 years." "My Dad brought me to all types of racing"
"My favorite part of racing is the speed." "To be racing for a NASCAR cup team." "I eat a lot of candy." "There is some really good competition." "I enjoy playing soccer, football and basketball. I also like big 1,000 piece lego projects." "I want to be a NASCAR cup team driver." "I also race Legend cars." WESTFIELD, IN - Hot off of the Indy500 race weekend, this week's WKA #RaceLife Spotlight features Sam Hinds who hopes to one day win the Indy500. However, Sam's short term goal is to win a WKA championship! The #71 Manufacturer's Cup racer not only races, but also runs cross country track where he qualified for the Junior Olympics, plays baseball and basketball (as #71). Originally, Sam was to race Jr dragsters but because of the age restrictions, immediately jumped into a sprint kart seat. Read more about Sam Hinds, below. "I live in Westfield, Indiana. Westfield is located about 30 minutes north of Indianapolis." "I have been racing for 7 seasons. I started racing kid karts at 5 years old at Newcastle Motorsports park." "Originally, we were going to race Jr dragsters, but couldn’t until I turned 8. At the time, my uncle did timing and scoring for the KRA series at NCMP and suggested we come watch a race. Realizing I could start racing at 5, we bought a kart that evening." "My favorite part of racing is traveling to different tracks. I also enjoy the competition level and satisfaction of doing well." "My short term goal is winning a WKA championship. My long term goal is racing in Indy car and winning the indy 500." "I say a little prayer to God to keep me safe and give me the strength to stay positive." "Josef Newgarden. I got to hang with him for a little after he and Mark DismoreSr. won Robopong." "I have two favorites; NewCastle Motorsports Park and Jacksonville." "I get to test my abilities against some of the toughest competition in karting. Also everyone at WKA is so nice and I get to hang out with friends." "I love sports, I run cross country, track, play baseball and basketball. It can be tough juggling sports with racing but we do the best we can. I also enjoy riding my bike and playing outdoors and of course video games." "I want to race indy when I grow up, If I don’t get to race I want to work in the racing industry, I want to design and build racing cars, or go into engineering." "Last Fall I qualified and competed in the National Junior Olympics for Cross Country in Birmingham, Alabama. I ran against 410 of the best runners." 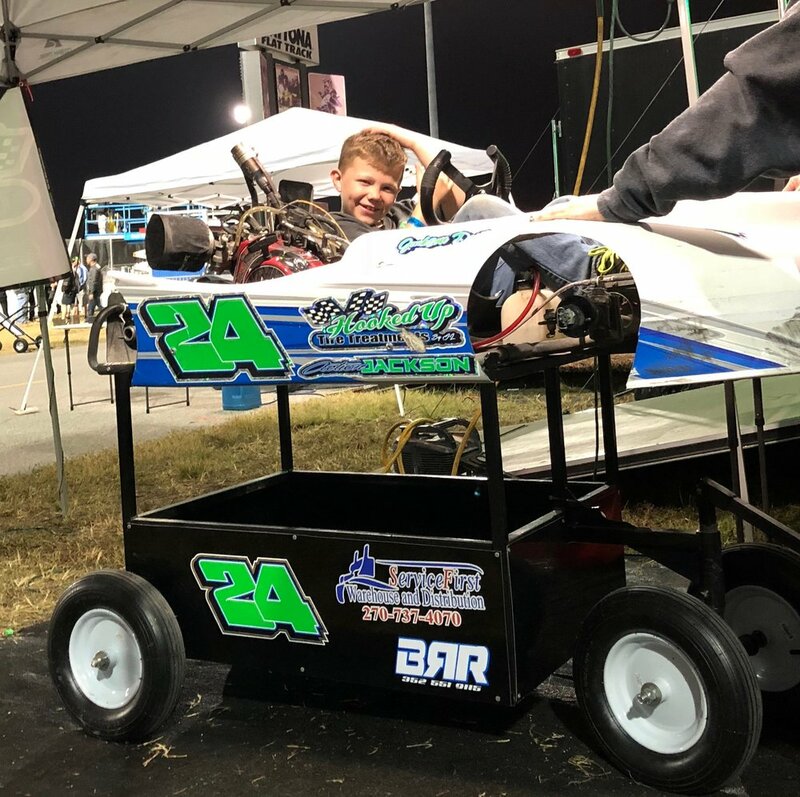 GROVE CITY, OH - This week we turn the spotlight to a WKA racer who started racing when he was only 4 years old and he hasn't stopped racing ever since. Aryton Grim, who's favorite racer just so happens to be the famous Aryton Senna, has a great attitude and is always happy to be at the track with his friends. And this kid has ambitions too! He wants to become an Indy car dirver one day and have a Bugatti, 6 kids, and a mansion in Florida! Read more about the ambitious 7 year old, Aryton Grim, below. "I am from Grove City, Ohio." "I have been racing for three and a half years." "My dad bought me a go kart for my 4th birthday." "To become an Indy Car Driver." "Winning, having fun, going fast and seeing my friends"
"I race the Manufacturer's Cup Series." " I want to be an indy car driver, have 6 kids, live in a mansion with my family in Florida and have a Bugatti." ELIZABETH, PA - This week, we are featuring a WKA racer who started racing in the rental kart league at our next Manufacturer's Cup stop--- PittRace. Tahlon Yockel's goal is to win a national championship and it seems as though he is off to a great start as he qualified for pole position at Daytona. When he is not racing, Tahlon enjoys running track and boxing! Read more about this 15 year old talent below. "I am from Elizabeth, Pennsylvania." "My first race was May of 2015 at PittRace." "My dad races cars and at Pitt they had rental karts. I begged my mom to let me drive them and she did. The kart director noticed that I was fast and asked me if I ever thought of racing. I told my dad and he came down to watch me drive the kart. I did a couple of kart rental league races and did well and LOVED it! My dad and I drove to New York to buy a used kart. No one knew of the brand. It was prehistoric. I raced that kart for a couple of club races at PittRace and did pretty decent." "My favorite part of racing is the competition in the sport and the adrenaline of the race." "My main goal is to win a national title and have fun doing it. I am also looking forward to racing sport cars and getting my pro license within the next two years." "I always check my gas cap and fist pump my dad before the line us up." "My favorite racer is Valentino Rossi. He is the baddest." "My favorite track is PittRace because it’s my home track and it’s where I started and also it is a very technical track layout." "I like going to the races and seeing all of my friends that I haven’t seen in awhile. I also like the competition in my class. The faster the drivers, the better it is. You can’t get any fastest driving against slower competition." "I run track and I box." "I want race cars at the highest level I can and I am considering going to school for welding." "My first pole position at a national was this year at Daytona." OVERLAND PARK, KS - This week we are featuring someone who has 51 years of kart racing under his belt and a whole multi-generational team of family members who race as well. John Scavuzzo is 69 years old and has 9 Scavuzzo's on his race team. His 4 sons; Santo 45, Richard, 43, Johnny, 41, Steve, 38, his son-in-law Brandon, 38, his 2 grandsons; Joe, 18, Gianni, 14, and the newest addition to the team is Mia, 12. His 3rd grandson Jonathan, 20 is on a temporary leave from karting, as he is serving in the U.S. Marine Corps stationed in Okinawa Japan. 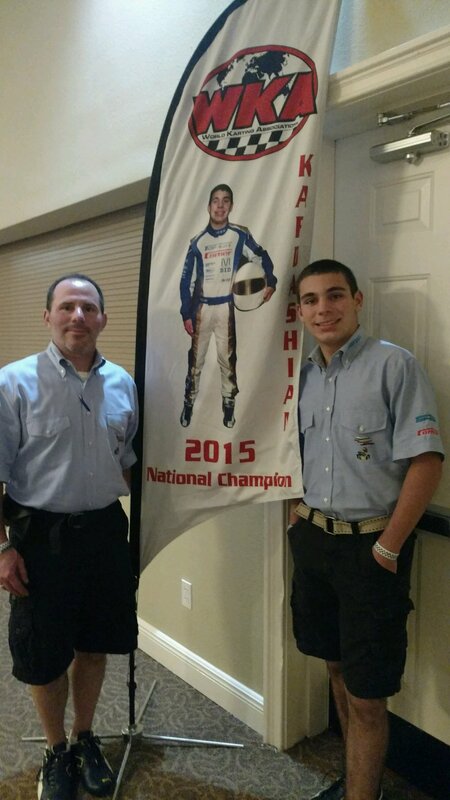 For John, karting is not just a passion----it is a bond that keeps his family close. Read on to learn more about John and the amazing Scavuzzo family. "We all live in Overland Park Kansas, a suburb of Kansas City. Located in the midwest it makes it very easy to race in 4 different divisions coast to coast. This year we have 12 races scheduled with our first at Laguna Seca (west coast). Our 6th race at Mid Ohio, (north), then number 8 is V.I.R. (east coast) then finishing up home in Topeka Kansas at Heartland Park. Each year we try to add 1 new track that the Scavuzzo team have never raced. Over the years we've added 24 different road courses which makes for a very challenging and exciting season." " I started racing with a local club in 1967 and my 4 sons in 1985." "The boys got us back into racing after we took a vacation in Destin Florida. We had a place on the beach so we were in the water every day but one. That particular day it was cloudy and a little chilly. So we elected to go across the street to the amusement park and spend the day on a small go-kart track. It started to sprinkle just enough to make it slick. The rest I am sure you can relate. They had so much fun on that wet track that they asked if they could get into enduro racing. That's all I needed to hear. When we got back to K.C. that Saturday I called an old racing buddy, Darrell Crowell and asked him if he had any of his old racing gear left over from when we use to race each other. He said he would check. That next Sunday morning I looked out my window and saw a pickup truck parked in my driveway with a guy sleeping in the front seat. It was Darrell. He said, "Take all this crap and send me a check for what you think it's worth. So we started off with 1 kart, 2 motors, one of them being a B-bomb, starter, clutch, pipes and a lot of extras. The rest is history. ."
"My favorite part of racing is the competition with each other on the team. All 6 of the older boy's, (4 sons, 1 son-in-law and 1 grandson) all compete in the same class, control spec 1 & 2. As far as the 6 are concerned, they are the only ones out there. We keep our own points standing with just our team. Bragging rights last all winter. " "The competitive racing in some form helps us in the competitive forms of business. The Scavuzzo family has 3 companies that compete in the food industry. We have to be at the top of our game when your involved in a commodity that is consumed every day. The saying " 2nd place is the first loser " holds true in our business." "My only pre-race ritual is I and me alone will start everyone on the team in each race, that's 6 in each class." "Michael Schumacher is my favorite." "Racing has brought our whole family very close together." To watch some of the Scavuzzo family's cool race videos, click the buttons below. FT. MILL, SC - This week we are featuring Miss Isabella Robusto for the #RaceLife Spotlight! She is a very talented driver who races multiple karting classes, Bandoleros and Legend cars. She will also be featured at the Charlotte Motor Speedway Auto Fair this Thursday from 2 - 6 p.m for the WOMEN IN RACING Exhibit highlighting the NEXT GENERATION OF WOMEN IN MOTORSPORTS. She'll have a Go-Kart and her Legend car on display all weekend but will only be signing Hero Cards on Thursday. If you are in the area over the weekend, come support her! Check out Isabella's talent in multiple disciplines in the video below and read her interview. "My Dad first got me into racing with my Grandfather taking me to watch many types of racing." "My favorite part is being one of the only girls and getting to pass the boys." "One of my goals is to race NASCAR or any other type of professional racing." "I like both Brad Keselowski and Emerson Fittipaldi." "That there are lots of karts and competition." "I like to ride my bike, play with friends, have fun with my brother, Will. And play the flute." "I have a twin brother, Will, who is an hour and a half younger than me." Click the button below to read more about Isabella's racing. SOUTH BELOIT, ILL - This week, we are featuring a WKA racer who not only races in sprint 2 and 4 cycle karts, but races on asphalt and dirt ovals as well! Cole Peschang is a 3rd generation racer who has been racing for 5 years now. He has a great attitude both off track and when it comes to racing, which shines in how he treats his competitors with respect. We asked Cole some questions about his #RaceLife, so here is a little peak into what racing is like for him. Here is Cole doing what he does best at a WKA race this past year at Atlanta Motorsports Park. "I live in South Beloit, Illinois for now. But I want to move South soon to race more often." "2017 will be my 5th year." "I am a 3rd generation racer, picking up from where my Dad and Grandpa left off." "I love the Road Racing because of the high speeds, but I also like Sprint Racing because of the strategy and competition." "To race SKUSA and to get a race car soon." "I tell my competitors, 'Good luck,' and wish them a safe race. Then I fist bump my Mom, Dad and Grandpa." "Josh Bilicki and John Force in Drag racing." "For Sprint tracks, US Air Raceway in Shawano, WI. For Road Racing, Atlanta Motorsports Park and Daytona." "I am a driver, coach and mechanic." "I race Sprint 2 and 4 cycle karts, I race asphalt and dirt ovals. My record is 172 wins out of 229 races. I've had Lucas Oil, MAVTV, Protect The Harvest, Champion Sparkplus, GoPro Cameras, and Competitive Edge Racing Software as sponsors since 2013." MORGANTON, NC - If you have met Gray, you can attest to her dedication, athleticism, and passion for racing. She has raced motocross, karts, and will be on a plane to Sweden to train in a Global Rally Cross Supercar Lite this month. We caught up with her just after she raced the 2nd round of the Winter Cup in Jacksonville, Florida to get the scoop on her #RaceLife. "I live in Morganton, NC." "I have raced dirt bikes since I was 4 and go karts since I was 9 or 10." "When I was 2 I got an electric 4 wheeler and kept rolling it onto myself so my dad decided to get me a dirt bike, so I raced dirt bikes. Then when I was 7, I broke my shoulder and couldn't race for a year. A year or so later I got back on a bike and started racing. When I was about 10 I started racing go karts and fell in love." "The excitement and also going fast." "When I turn 14 I really want to race global rally cross (GRC) and other types of races on 4 wheels." no one talks to me." "My favorite racer is Patrick Sandel because he races GRC." "Probably Wisconsin or GoPro Motorplex." "I like that everyone is very nice and helpful." "I like to go on hikes and also like to swim." "I want to race GRC (Global Rally Cross), open wheel or NASCAR. I also like to bake and I started my own YouTube baking channel, Its called 'Sifting Gears.'" "I have 2 older sisters, 2 cats, and 1 dog."